Check our compatibility guide if you want to know whether Acrolinx for Safari works with your local platforms. You can use Acrolinx for Safari to check content in editable fields on most web pages. For example, you can check content in articles you write in an online help center like Zendesk. You can even check an email in Gmail or check content in a Customer Relationship Management (CRM) tool. Acrolinx for Safari is particularly great if you create web content but don't yet have an Acrolinx product to use in your web CMS. 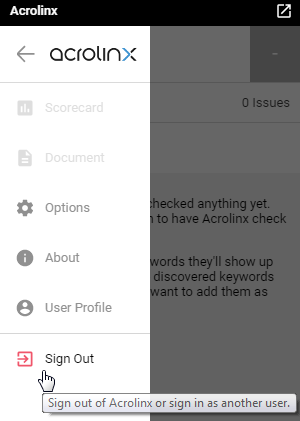 Acrolinx for Safari checks content that's in editable fields on most web pages. How can I install, update or uninstall Acrolinx for Safari? Acrolinx for Safari is available from the Safari Extensions Gallery. You can install it like any other Safari Extension. Go to the Safari Extensions Gallery and search for Acrolinx. Once you've installed Acrolinx for Safari, an Acrolinx icon will appear in your Safari toolbar beside the address bar. To update Acrolinx for Safari, you don't need to uninstall the old version. Just install the new version as described above. Open Safari and go to Preferences... . Select Acrolinx for Safari from the left-hand panel. You can toggle showing and hiding the Sidebar by clicking in your Safari toolbar. To use Acrolinx for Safari, you'll need to Enable Cross-Origin Resource Sharing (CORS) on the Acrolinx Server. Check out this article on how to Enable Cross-Origin Resource Sharing (CORS) on your Core Server .